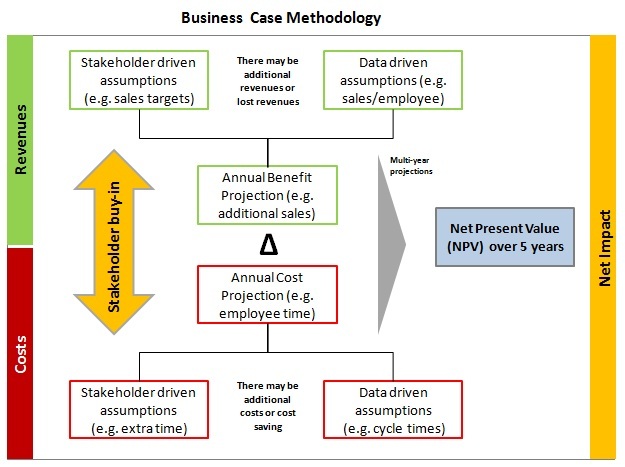 Business Case Methodology: business cases are prepared to help a company decide whether to proceed with a given project. To start off, the preparation of the business case requires understanding of the key metrics or key drivers that help company either generate or spend money. The money can be generated by increasing revenues or sales and/or decreasing costs. The key revenue driver is increased sales, for example due to an increased number of sales agents. Decreased costs may be as a result of increased capacity in the back office, because some of the processes that used to be manual are now automated. The more data used for the assumptions the better. Another way to validate assumptions is to obtain the key stakeholder opinion or buy-in. Usually, any project also carries investment costs that are subtracted from the benefits. A good business case also has a multi-year view, e.g. creates 5 year projections. This future cashflow is discounted by the interest rates. The sum of these discounted cash flows is added to come up with a net present value – NPV for the project. Other business case metrics include the internal rate of return – IRR and average annual benefit.